XLIFF is an XML-based format created to standardize the way localizable data are passed between tools during a localization process and a common format for CAT tool exchange. XLIFF is the industry-standard bilingual file format. It is supported by several CAT tools. Many CAT tools make use of an intermediate bilingual file format, i.e. a file containing both source and target language segments, and in some cases also the structure of the original file. XLIFF is a format that's used to exchange localisation data between participants in a translation project. This special format enables translators to concentrate on the text to be translated, without worrying about text layout. The XLIFF standard is supported by a large group of localisation service providers and localisation tools providers. The most important reason for you to use XLIFF when translating documents is that you can use a single file format when translating different kinds of documents. - No overhead for translators to buy and lern properietry software. - Some formats are exceedingly difficult to translate in their native format. Store the extracted strings in a XLIFF document. Send out the XLIFF document for translation. Extract the translated strings from the XLIFF document and reinsert them into the original documents. Text extraction: Separation of translatable text from layout data. Pre-translation: Addition of existing translation to the XLIFF file generated in the previous step. Translation: Performed by a professional translator. Reverse conversion: Generation of a translated document from the translated XLIFF file. Translation memory improvement: Storage of new translations in a translation memory (TM) database for later reuse. One of the advantages of XLIFF is its relative simplicity. 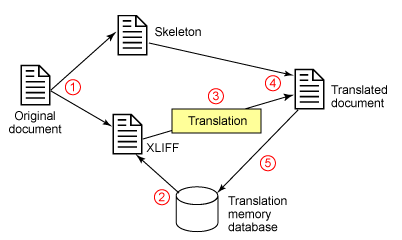 An XLIFF file can be described as a collection of translation units. Each translation unit contains a sentence or paragraph that's extracted from the original document in an element called , and the translator has to fill a element with the appropriate translation.